The Society of Mercy is in communion with Archbishop-Metropolitan Douglas Titus Lewins, Titular Archbishop of Lindisfarne. He is the 7th successor to Archbishop Mathew as head of the Old Roman Catholic Church of Great Britain. Archbishop Lewins was consecrated in 1991 and succeeded to the headship of the Church in 1993 following Archbishop Dennis St. Pierre. 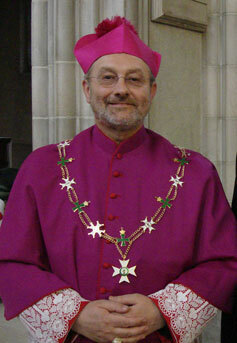 In addition to his leadership of the Church, Archbishop Lewins serves as Grand Prior to the Order of Saint Joachim. The Archbishop resides in Lincolnshire and serves on several health-related committees as well as functions as a chaplain to the British Transport Police. He previously served as chaplain to the London Police. Our Superior General, the Most Reverend William Myers, was born in Tennessee. He acquired a Bachelor of Science degree from the University of Louisville, a Juris Doctorate from Northern Kentucky University, and a Master of Business Administration from William Howard Taft University. Ecclesiastically, he earned a Licentiate of Theology from St. Pius V Seminary and studied for a Diploma in Orthodox Theology thru the University of Eastern Finland. He also completed a unit of Clinical Pastoral Education at both a general and a pediatric hospital. He collaborates closely with and is head of the Order of Our Lady, Help of Christians and the Order of the Precious Blood, and is a member of the Order of Saint Joachim as well as other charitable groups. His coat of arms are displayed below. The motto is "Seek Ye First the Kingdom of God." The shield is surrounded by the galero and tassels of a bishop. The shield itself contains a cross and fleur-de-lis, which symbolizes his French family origin, devotion to the Blessed Virgin Mary, and his home city. Archbishop Denis Waterbury is a bishop emeritus with the Society . He was born in Colorado and completed a Bachelor of Art degree at Saint Martin's University. He then pursued a theological education at the Pontifical Atheneum of Saint Anselm (Sant'Anselmo). He was consecrated as bishop in 2002 and resides in St. Helen's, Oregon.